For Stylianos has left this life. Stylianos joyfully stands by God on the twenty-sixth. * He was probably born in the sixth century in Paphlogonia, though this is uncertain. We know that Paphlogonia had a portion of his relics. 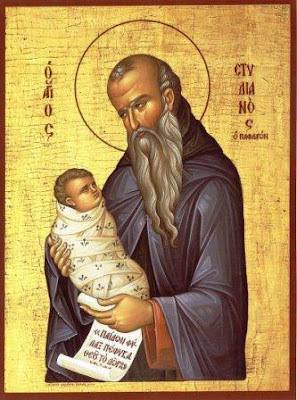 Interestingly, Saint Alypios, who was a pillar saint or stylite, was also from Paphlogonia, lived at the same time as Saint Stylianos, and the name Stylianos comes from the Greek word for "pillar." ** On the island of Icarus there was a tradition to keep an icon of St. Stylianos in the house, and when a child came down with a sickness the parents would bring the icon to the Divine Liturgy and then bless the child with it. In Crete the parents of children who died named the departed child "Stylianos" if a boy or "Styliani" if a girl. Even during the time of illness, the child's name may be changed to "Stylianos". Among the Vlachs one also finds men named "Stergios" or "Stelios" to fulfill a vow of the mother who had trouble bearing children. *** The skull of St. Stylianos is kept at the Metropolis of Thessaliotidos. Other portions of his relics are at the Monasteries of Damastas in Fthiotidos, Leimonos in Lesvos, Dadiou in Fthiotidos, and Kato Xenias in Almyros of Magnesia. 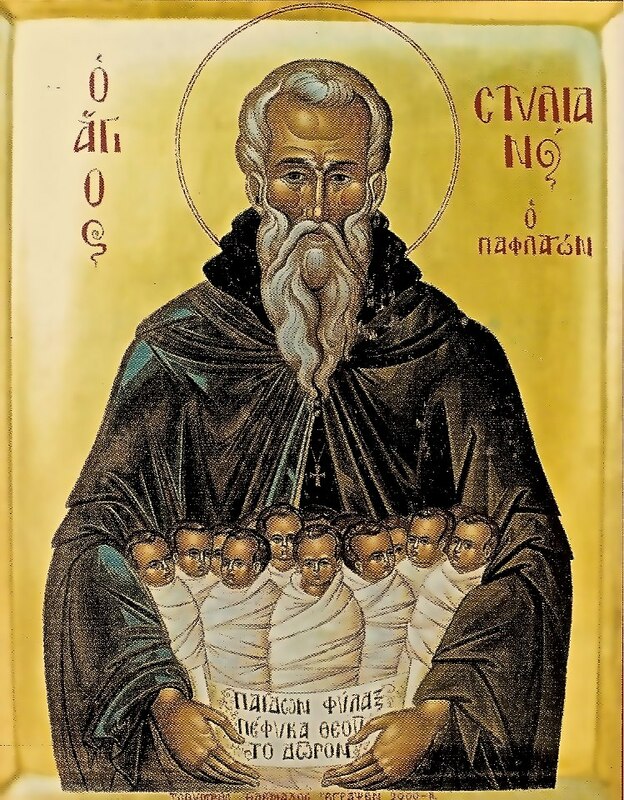 A living pillar of abstinence, an immovable pillar of the Church, you showed yourself to be blessed Stylianos, having been dedicated to God from your youth, you were perceived to be a dwelling-place of the Spirit. O Venerable Father, entreat Christ God, to grant us the great mercy. Sanctified from the womb like another Samuel, you glorified God by your labors. Having becme a healer and protector of Christ's babes and sucklings, He has glorified you, O Stylianos.